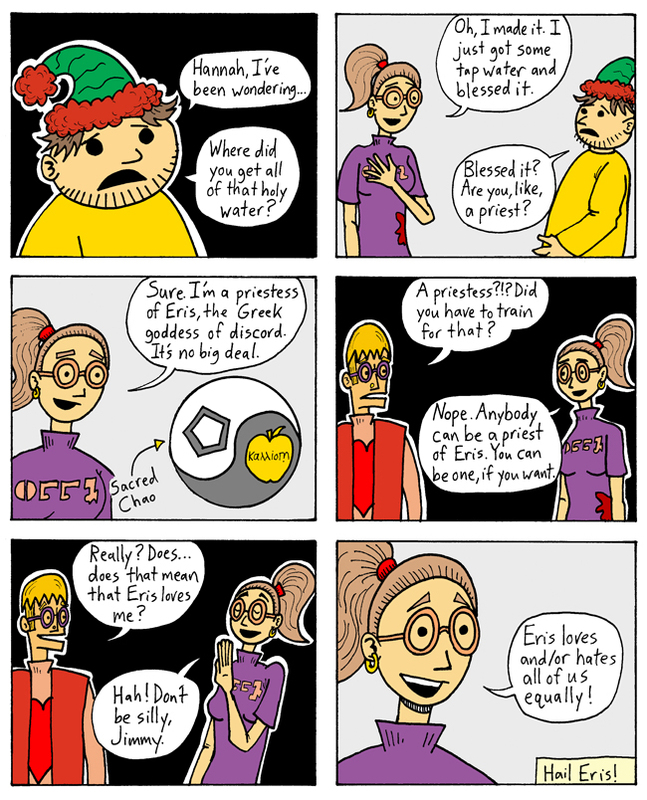 Actually, Hannah, Eris love/hates some of us more than others. She's fickle that way. In his question in panel one, Patrick is referring to the holy water that Hannah used to shoot up a bunch of demons. In the author's note to the October 9th episode I wrote, "Where did Hannah get holy water? Tune in next week--the answer will amaze you!" I always intended to have this conversation, it just took seven weeks longer than I expected to get to it. Now you know the truth--Hannah is a Discordian. And, remarkably, Discordian holy water works against demons. Unfamiliar with Discordianism? Don't worry, there are many websites devoted to this great and noble creed, but as with any religion, the best place to start is with its holy scripture. In this case, that would be the Principia Discordia, which you can read in its entirety here.